Two weeks ago I went to Paris with my mother and two aunts who are visiting me now. I lost count how many time I come to this city. Some friends of mine live there which makes it easier for me to give the city a visit. And being a self-declared Francophil I really love this city of light as it offers many things I am interested in: good food, art, beautiful architecture/city scenes to capture and of course the melodious language itself. 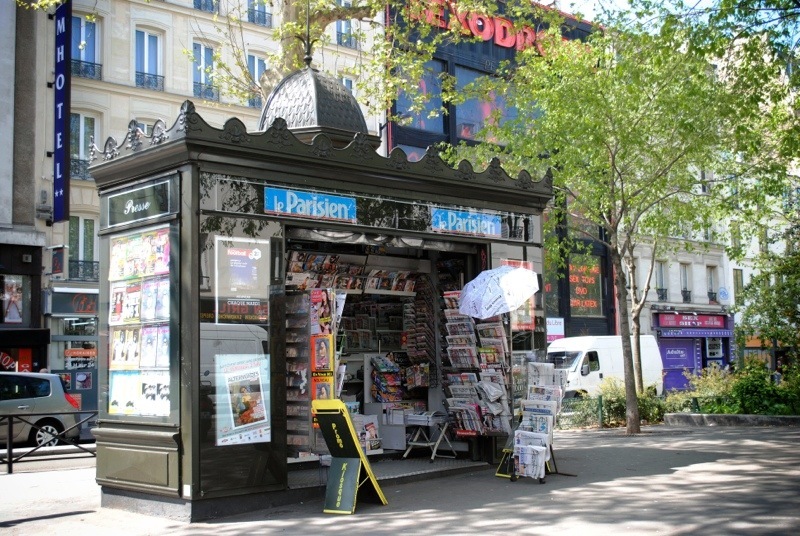 In this chain post about Paris visit I posted a thread about a hidden gem last week. Getting out by Bir Hakeim metro stop most tourists coming by metro walk and approach the Eiffel Tower alongside the Seine riverbank. From this position the tower is at the right side, at the left there is Trocadero. However I recommend to see the tower from the other side, from Champs de Mars park (see pic). La tour Eiffel (Eiffel tower) at dusk, around 8.30 pm. Handheld camera no tripod. 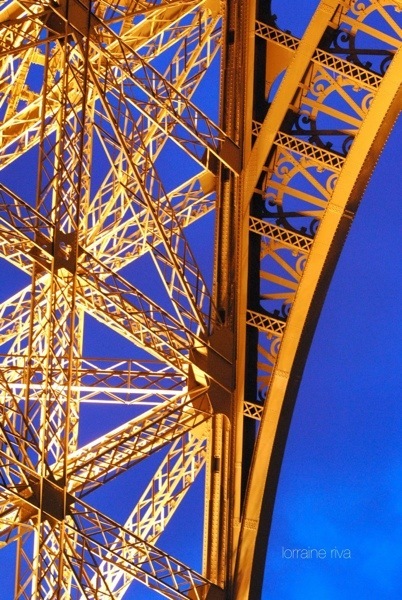 Did you know it takes 7 years to paint the whole tower? 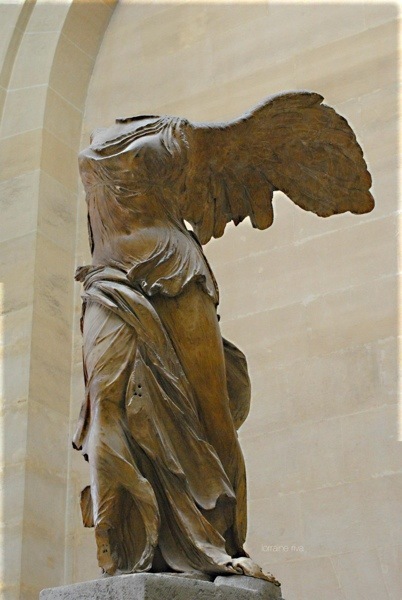 One of the two statues standing at Trocadero facing the Eiffel Tower. 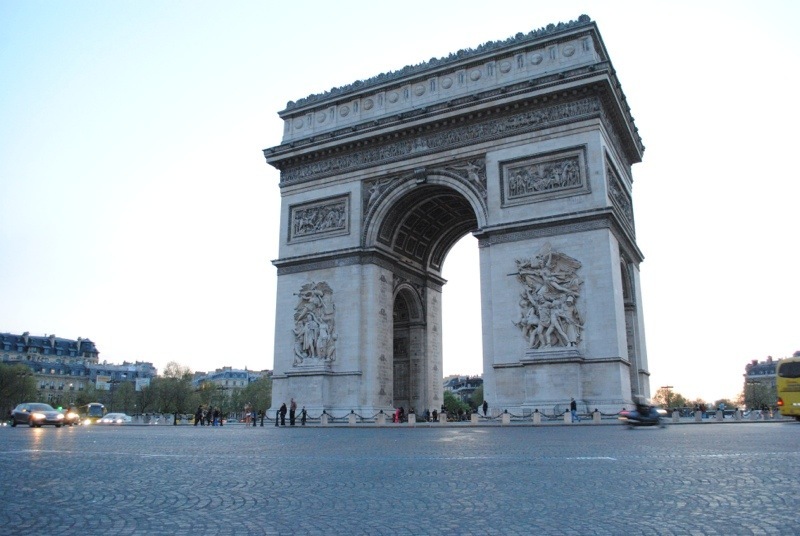 Arch de Triomphe on a round about better known as l’étoile which means star, due to the 8 lanes around it. 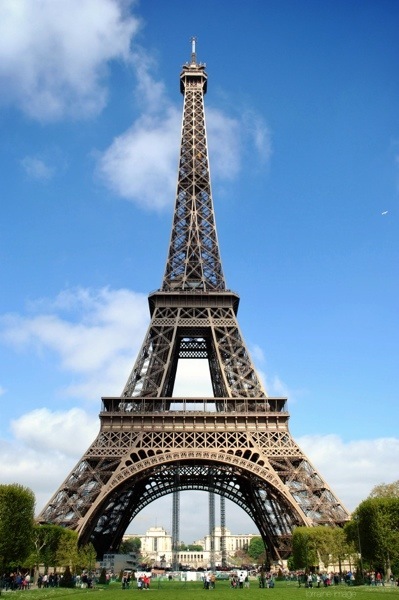 It is one of Paris’ landmarks. Worth a visit but beware of the pickpockets. 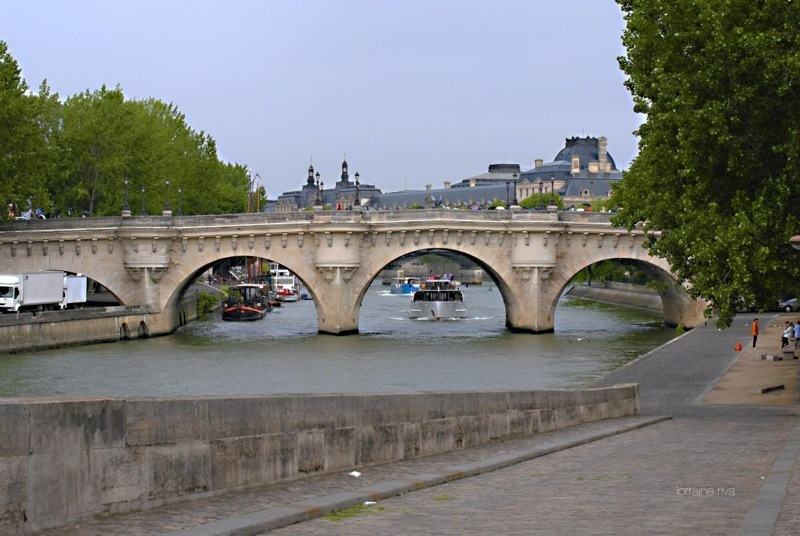 Pont Neuf (New Bridge) is Parisian oldest bridge. I imagine mobs on this bridge marching to Place de la Bastille during the French revolution. A corner somewhere in Saint-Germain. 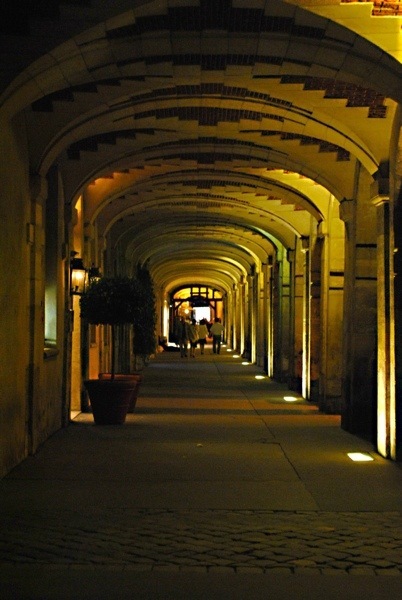 A passage of a chique apartment building at Place de Vosges in Le Marais neighbourhood. It seems like a Roman temple but it really is a church! Presenting Madeleine church, metro stop Madeleine. There is Pierre Hermé salon de thé with its divine macarons on the corner. 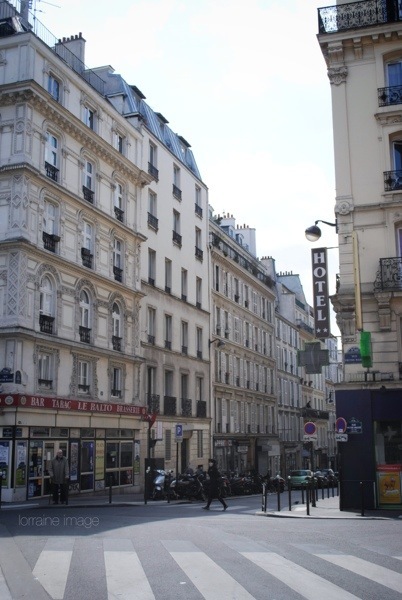 This church is a block away from Rue Fauburg de Saint Honoré where the boutiques of luxurious brands stand. 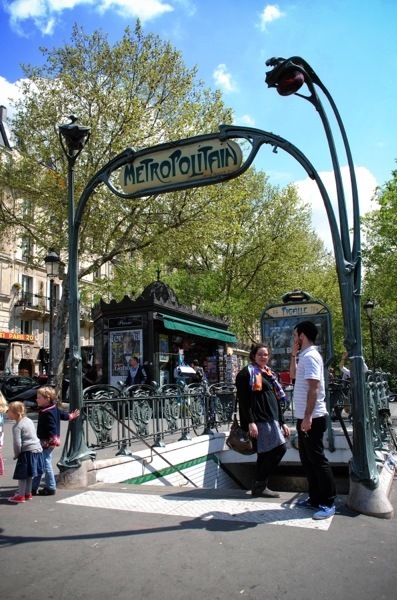 Beautiful art deco metro entrance at metro stop Pigalle, before getting to Sacré Coeur church. 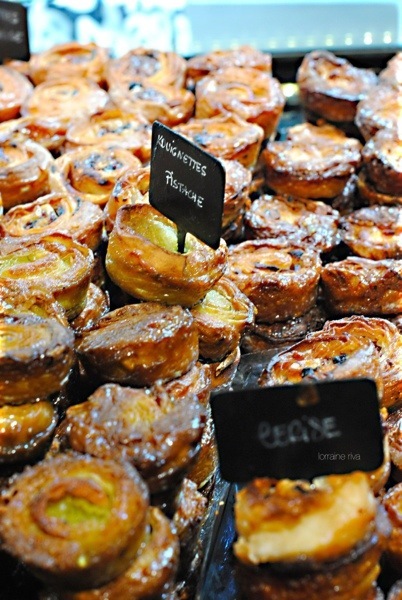 Puff pastry with Pistachio filling at a pâtisserie in La République quarter. 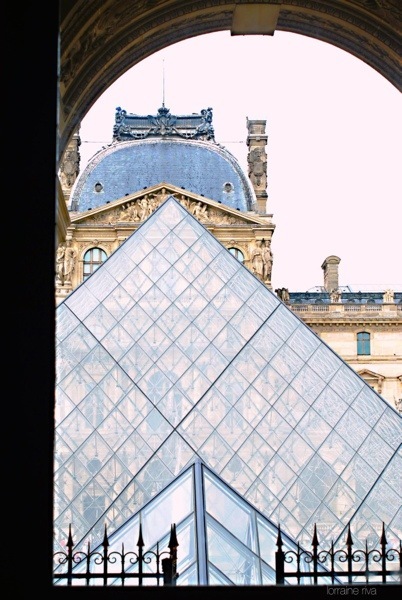 Louvre pyramid seen from Denon wing, Louvre museum. 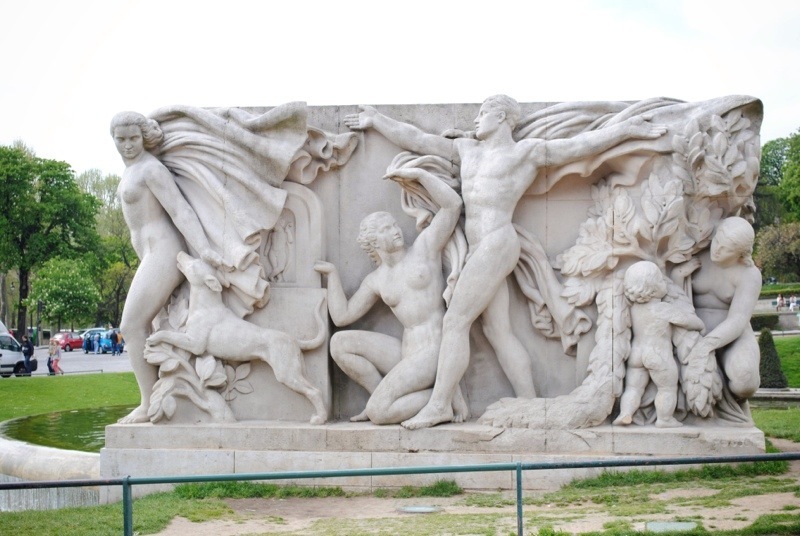 Did you know there is free entry for children and young adult untill 26 years in most Parisian museums? Musée du Louvre, Musée d’Orsay, Musée de l’Orangerie, Centre de Pompidou are among them. An enormous marble statue of Nikè of Samothraki from 2 BC at the entrance of Denon wing, Musée du Louvre. Impressive! Balzac’s statue at a park near Pont d’Iéna. 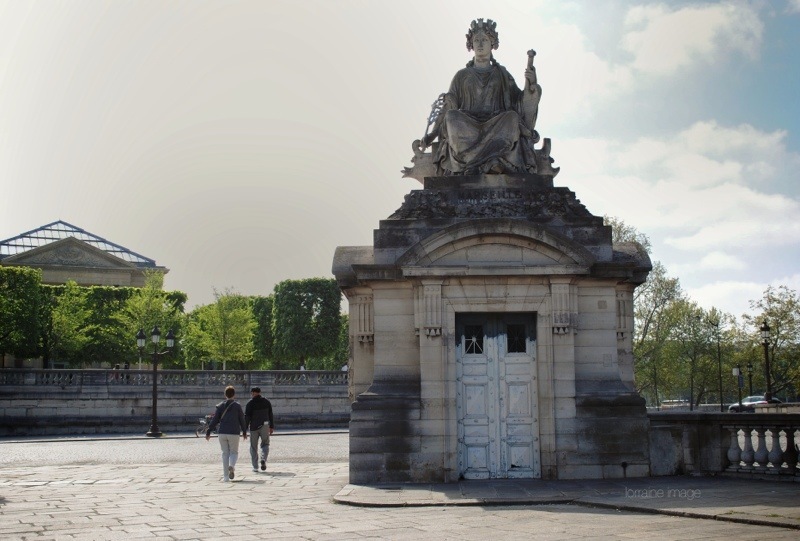 One of four statues guarding Place de la Concorde, by the entrance of Jardin de Tuileries. 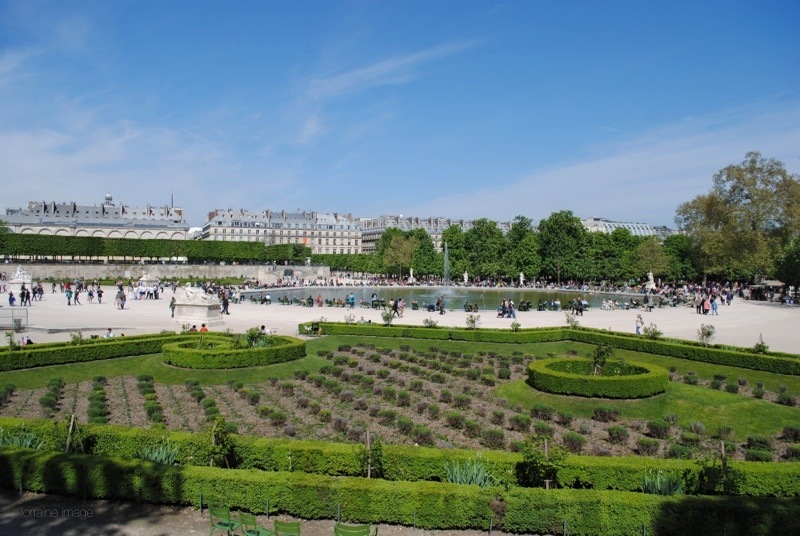 Packed Jardin de Tuileries at a spring friendly temperature of 22 degree Celsius. Tourists and locals mix altogether in this huge ground. 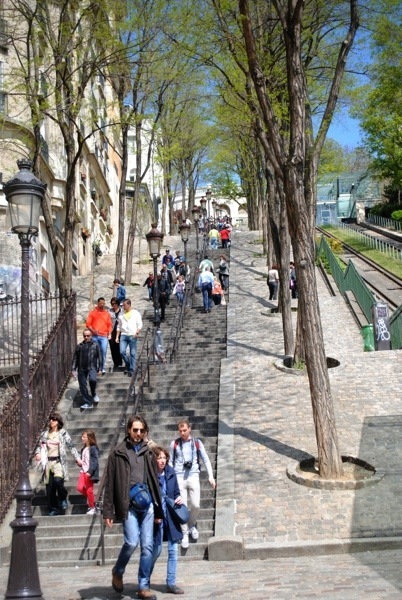 The stairs next to Sacré Coeur. 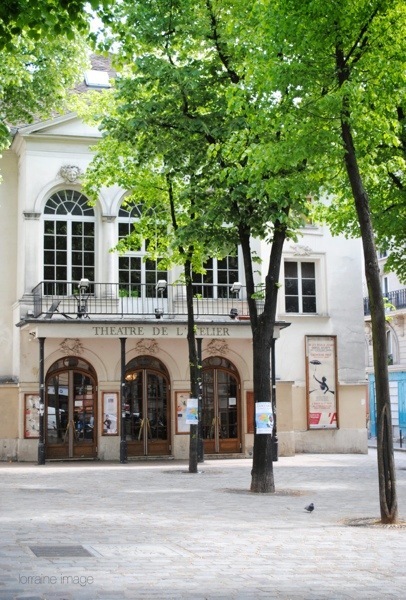 A theater or an atelier? Somewhere in a silent part of Montmartre. A corner somewhere in Bois de Boulogne. 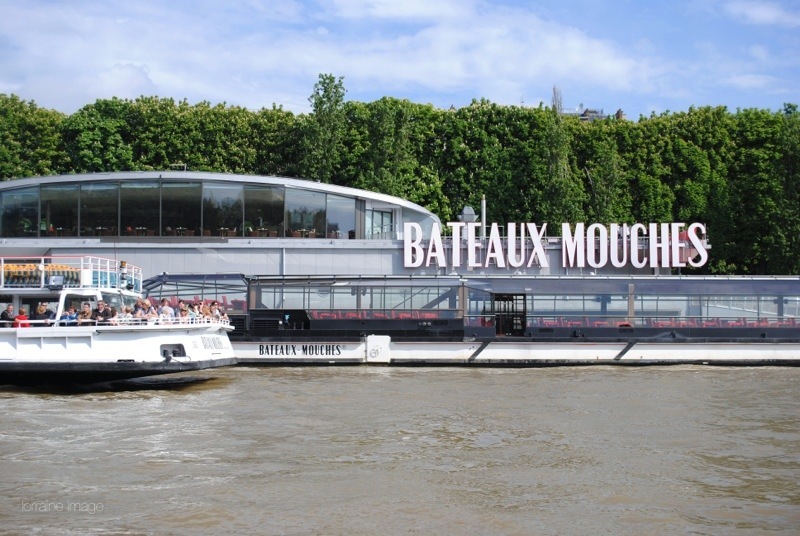 Cruising along the Seine by Bateaux Mouches. For me it’s nothing to shout about. 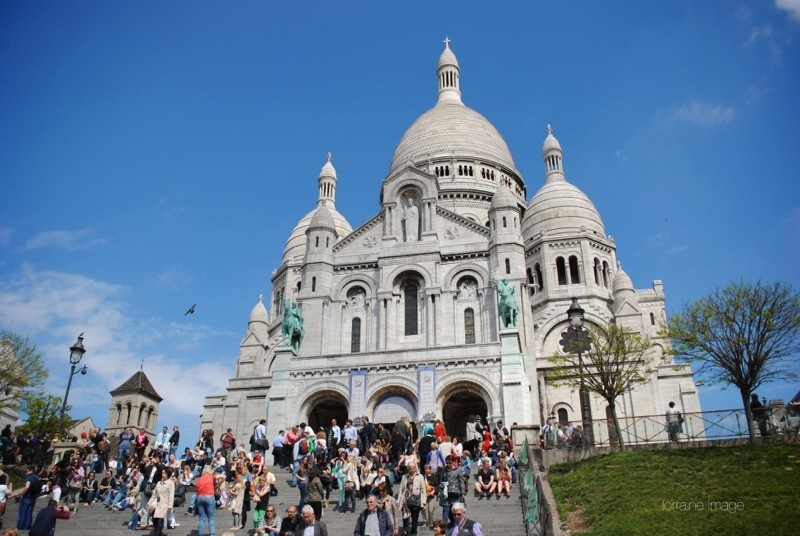 Sacré Coeur church on the top of the hill. The view is stunning but aggressive vendors trying to sell you their goods ruin the atmosphere. Pretty selfish of me to wanting this tourist object only for myself eh? A board of Paris respire (Paris breaths) campagne. 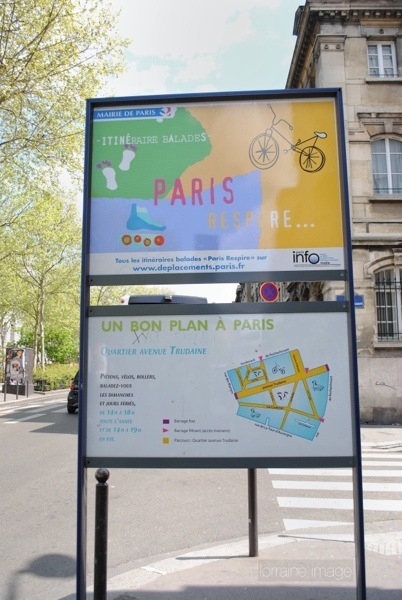 Municipality of Paris started this campaign 6 years ago declaring some areas in the city as car free on Sundays and public holidays. 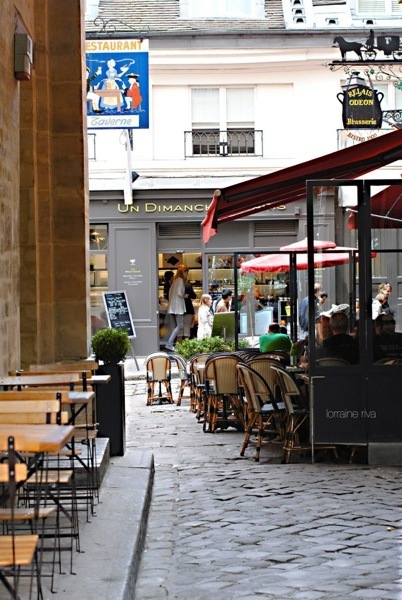 Paris respire and renting a bike is d’aprés moi, the best way to explore the city. That is Paris seen through my lens in a sunny long week-end in May. Paris, Je reviendrai sûrement! Tags: Madeleine church, Musée du Louvre, Nikè of Samothraki, Paris, Pigalle, Sacre Coeur, travel. Bookmark the permalink. Bedankt. Kalo ke Paris selalu aja ketemu yang baru Pie. Wow, obviously you are all over the place gathering Paris-information . You will be the best informed first-time visitor ever :). Ha, What a small world after all 😉 Colson and I have known each other since 2008. Enjoy your time and let the city enchant you. 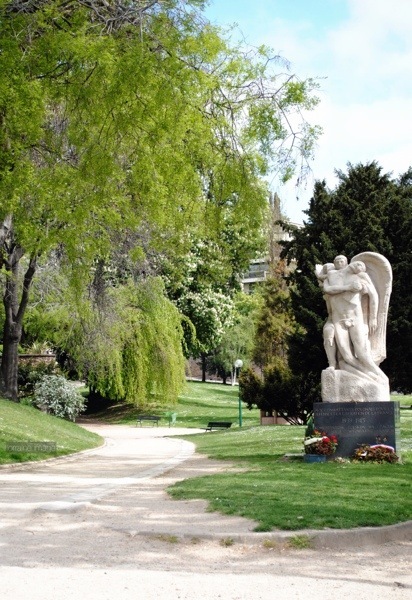 Did you also visit Cimetière du Père-Lachaise? Thanks Colson. Last year I visited Jim Morrison’s grave in La cimitière du Père-Lachaise. 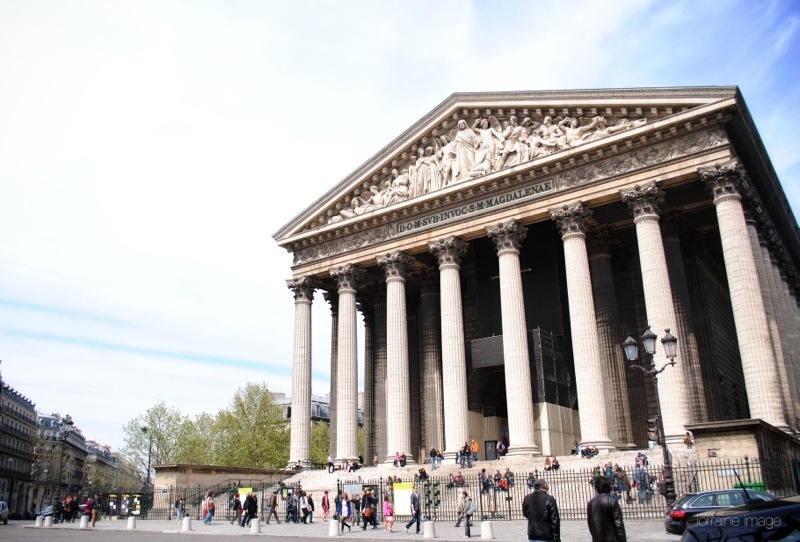 This time I went to Pantheon instead. Terima kasih. Kamu juga fotonya bagus-bagus aku lihat. Makasih juga udah mampir ya. Kapan ya aku bisa kesini ??? Next anniversarry? Paris itu bagus, pasti suka deh. Yoyen, ini tahun lalu yg mama dan tante2 elo dateng for a visit ke Belanda? It seems not so long ago tapi uda tahun lalu. J’aime visiter le cimetieres, en fait me grand-parents sont enterres a Pere-Lachaise. As-tu ete a Cimetiere de Montmartre? Terima kasih Winny. Salam kenal juga dan terima kasih udah mampir disini.